International Agencies Co. Ltd (Intercol) brings you Sheaffer’s Scuderia Ferrari line of products, just in time for the racing season. As April begins, so does the F1 fever, bringing with it the adrenaline rush of racing. Join the fun and treat yourself or your petrol-head friends to a memento commemorating the history of racing and its spirit, as Sheaffer, one of the world’s leaders in luxury writing products, presents the best gift of the season. Together with Scuderia Ferrari, Sheaffer Writing Instruments introduces the Scuderia Ferrari Collection. Comprising four contemporary lines, these premium pens reflect the same profound passions, extraordinary talent and incredible expertise that drive the Scuderia Ferrari Racing Team. Each collection is created with the highest level of quality, proudly displaying the Scuderia Ferrari Shield and the world-renowned Sheaffer White Dot, a symbol of excellence. The four collections are the Ferrari Taranis, Ferrari 300, Ferrari 100 Intensity and Ferrari VFM. Under Ferrari Taranis comes F9519, which is available in Rosso Corsa style with chrome plate trim. Ferrari 300 offers both F9503, which is also offered in Rosso Corsa style with chrome plate trim, and F9518, which has a chequered flag-style engraving with gloss black finish, featuring chrome plate trim. Ferrari 100’s F9501 has the same trim as that of F9519, while F9506 is offered in tyre tread-style engraving and features a nickel plate trim. Lastly, under Ferrari VFM is F9510, which is available in gloss yellow and features the same nickel plate trim of F9506. All mentioned models are available as ballpoints and fountain pens, and come in luxury gift boxes with one-year limited warranty from Sheaffer. 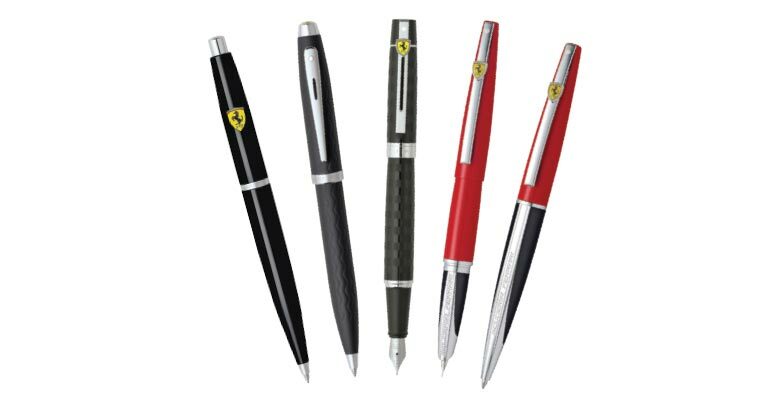 Sheaffer’s Scuderia Ferrari products are exclusively distributed by Intercol.